Under the Banner of Heaven is an excellent book; easy to read; a real page turner. It is written by a journalist and covers major stories in the history of the Mormon church. 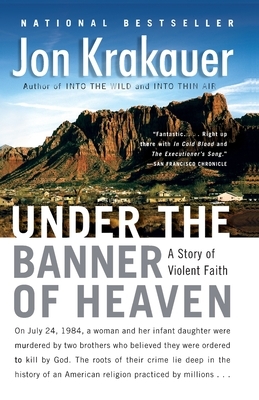 Don't read this book if you're looking for an objective view of Mormonism, but if you wish to learn about the extremist, fundamentalist branch, denounced by the mainstream, a group known as the FLDS, and their horrendous practice of polygamous marraiges to very underage girls, it's certainly an eye-opener. This is an incisive look into the fundalmentalist mormon culture. I assume it was used to a great extent by HBO in the making of its series Big Love. Anyone wanting a better understanding of what is going on in El Dorado Texas should read it. John Krakauer is, I think, one of the very best storytellers of our time! In this book, he takes history and factual current events, and turns them into a spine-tingling thriller. He is concise, with an intelligent and interest-holding way with words, and brings the reader into the very heart of the subject he is writing about. I simply could not put this book down, although in the beginning, I picked it up more from a sense of duty to be informed, rather than expecting to be "entertained" by reading it. I would recommend this book to anyone who is interested in history, religion, the American past, or to anyone just plain wanting a "good read"! Powerful as the 48 hour mystery TV series! I was somewhat reserved in choosing to read this book at first, but at the time there was so much news going on (being televised) about Mormon Fundementalism and polygamy that I had to grab it. By covering a savage murder orchestrated by two brothers along with intertwining the profound yet evolving history of the Mormon religion kept me interested throughout the entire book. The author does a fantastic job in covering the foundations of early Mormonism along with disecting from it the extreme side of the religion being the fundementalist side where the murderers from this story evolve. I have read "Into Thin Air" by the same author which i enjoyed but not as much as this book. I recommmend it strongly to anyone whom wants a taste of what impast Mormonism has had in the past and what it deals with in the future as well.